Sarah Bare and James Huber. Photo by the author. Conversations XXV-XXVII discuss how art, whether it is walked over or walked around, and history can intertwine to portray influential messages about society. 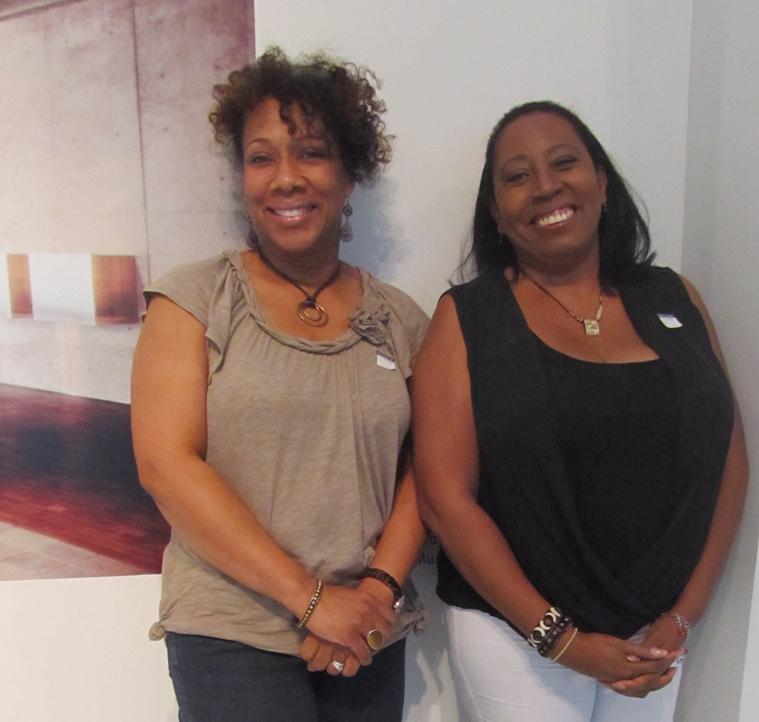 Sherri Rogers and Linda Ranson visit the Museum on August 30, 2013. Photo by the author. Sherri Rogers and Linda Ransom have such an immense joy of art that they decided to keep their introductions brief in order to discuss 3o Americans straight away. Linda is a business owner from Wisconsin. Her companion, Sherri Rogers is an educator for Milwaukee Public Schools. When not educating her pupils, she spends her time traveling with her family. Sherri: I thought the exhibition brought through a lot of emotions – some happy, some kind of confusing. I think that one of the most interesting things are the contradictions. It is like, sometimes, you would look at one painting and it would represent something positive. And then, right around the corner there was something that was totally opposite, representing something like poverty. Linda: I thought the exhibition was very well presented. I did feel that the first part of it exuded a lot of pain. I guess as an African American looking at the exhibition, you see a lot of the sorrow and the pain that was expressed in the pictures as you head towards the middle. It lines up a bit, I guess. To me, 30 Americans depicted more of the past. I was familiar with the history. I have lived the history. It reminded me of some of my parents’ history to some degree. At the same time, there seemed to be a theme of struggle and, for me, it is a part of it, but it is not everything… Rather, I am usually more of a futuristic type person, modern, more contemporary. Sherri: I think a lot of times when you see art museums you always feel as though you have to be a lover of art, a lover of paintings, but I feel that this exhibition just kind of represented more history, and more of the good and the bad. I think in order for us to achieve any type of success we need to know where we came from: some of our struggles [and] some of the things we really strove to overcome. Linda: I think a person being culturally well-rounded is something that everyone should strive to do and I think 30 Americans is a small avenue of the bigger picture as far as art is concerned. So, if you are not familiar with visiting museums or artwork in general, this will be a good place to start to educate yourself. Then, you can move on from here into the bigger picture. Sherri: The painting of the two portraits of the African American women One day and Back Then (Seated and Standing) [by Xaviera Simmons]. I’m not sure if it is a minstrel, but it was just had a lot of emotion in there. There is the representation of black power. There is a representation of slavery. There is the representation of movement, maybe even a black power movement. Linda: The artwork with the circular young space, with the world of cities [Untitled by Purvis Young]. I like that one because as soon as I saw it, I automatically thought of the world and how city life – being a city girl – means seeing the high rises, which is significant to a city as far as production businesses money a city thriving, growing, etc. Then, at the same time, you could have all of this going on in the city and in another part of the city, it can appear upside down, sideways, not experiencing the growth, the thriving that is taking place and not even having some of the funds that are going to help the high rises go up. It is almost like they are being taken from the part of the city where the city is being deprived… I am not sure what this [motioning to part of the painting] was supposed to represent, but, to me, it represented the dove, which is the symbol for the Holy Spirit. In the midst of and despite the poverty and segregation that you can see here. To me, just seeing that dove there was just a symbol that God is still in the midst of it and that he always knows what is going on. And that he is looking over all of us. Also, this painting is round because it represents how the world is and how God is everywhere. Sarah Bare and James Huber visit the Museum on August 28, 2013. Photo by the author. Charming local couple Sarah Bare and James Huber exhibit their dynamic discussion about 30 Americans for the readers of 30 Encounters with 30 Americans. Sarah has lived in Milwaukee since 2001. Kind as well as nimble, Sarah works with her hands as a student, artist, and massage therapist. Meanwhile, James, a Wisconsin native, likewise works with his hands as a bicycle mechanic at Cory, The Bike Fixer in Milwaukee. Sarah: The exhibition was great. I was surprised at how many different mediums were shown… I knew it was a contemporary exhibit, but it felt really young, new, colorful and full of life. James: 30 Americans was pretty cool. Definitely – I will go along with Sarah. I thought the exhibition was really good… I like all the different mediums. Sarah: I would say, “Definitely come.” The exhibition is interesting and provocative. It is fun to come with another person and sparks a lot of conversations about sexuality, race relations and freedom of speech… Also, The Post-it notes were really fun. Being able to part of the exhibit and getting to see other people’s thoughts of it, like what provoked them. You even hear the chatter in each room. We [motioning to James] were thinking about what they [the fellow visitors] are going to say. James: I really like the mix of classical and contemporary styles in a lot of the artwork. There is so much attention to detail… It was a really good exhibit. I liked it a lot – so many different styles. Sarah: Well, I mean we [motioning to James] talked about a lot of the pieces as we were walking through… I think I spent the most time in front of [Non je ne regrette rien by Wangechi Mutu], looking at it from end to end. All of her work and just the watercolor and the use of mixed media, but I think we spoke the most about that piece of carpet [Untitled by Rodney McMillan]. It was like you imagined the room. James: You can definitely tell it was well-used in the house. Like lots of stuff had happened there over a long period of time… A lot of stuff happened on the carpet. Sarah: [It looks] kind of like sadness and despair for me. It was like someone left it this way and it took a period of time to go from some white pristine room to this. It was kind of sad, you know. You never heard that. I imagined what were in the walls and where the furniture was, and you could see the hallway and where the doorways and everything were. You kind of imagined the room and things that went on inside of that room. I think we spoke a lot on that room. James: I have one specific artist [Kehinde Wiley] that I really liked looking at… I like the style a lot. I like the look of classical and modern mash-up. It was good: super colorful, super defined, like almost semi-realistic. It is very classical looking. Sarah: I really like seeing the branding, the clothing and the reference to the major leagues. James: Also the cell phones and Nike shoes. Sarah: The Nike shoes, yes, and the nylon pants… Tattoos, specific facial hair styles, etc… Even the very serious facial expressions, there is something curious about them. It makes you wonder what sort of mode [the portrait sitter] was in thought and where the present day person was. Like you knew where the inspiration came from, but what was he [the artist] talking about with the person sitting for this painting? Shawn Gulyas visit the Museum on August 30, 2013. Photo by the author. Shawn Gulyas has lived in Milwaukee for over twenty-five years. A professional in the human resources sector, his primary tasks include executive coaching and training. 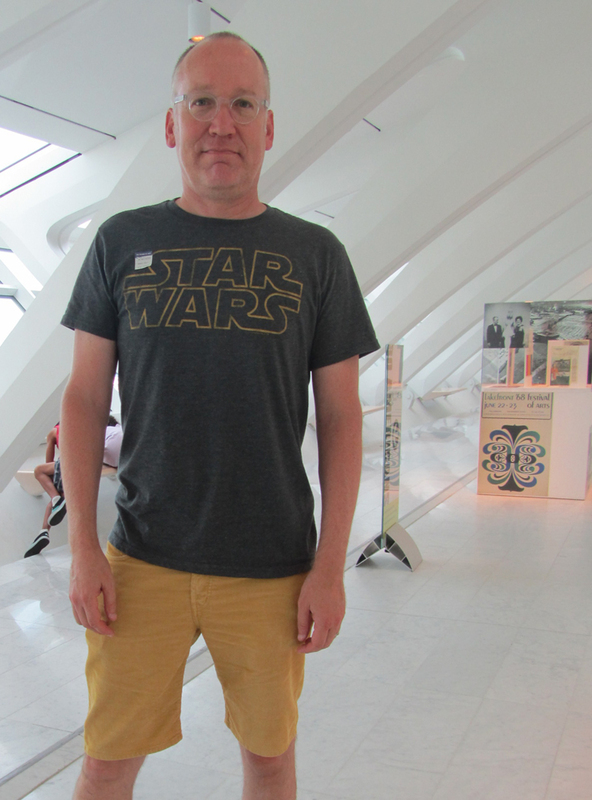 Actively benefiting from his Membership to the Milwaukee Art Museum, Shawn attends as many of the Museum’s events and exhibitions as possible. Shawn’s visit on August 30th marks his third and final opportunity to visit 30 Americans as well as a record among the participants of the 30 Encounters with 30 Americans blog series. Shawn: I like the exhibition. I think it is challenging for Milwaukee. That is why I, personally, think the exhibition is important. There is a challenge posed to the city. The first time [I came was] just to see 30 Americans. The second and third time was bringing other people to see the exhibition. So, that is what brought me back. Although, I would have come back at least one other time either way. Shawn: I think it is important for everyone to see the exhibition because, again, I think it will challenge them with artists doing different kinds of art… Plus, I think [coming] from a different cultural/race perspective, it is important to just open your eyes to what is out there in the artistic world; a different view on what is art. An example, well, I think Nick Cave’s pieces are sculptural, but they also have a costume feel to them at the same time… The works are sort of like reverse performance art, actually… You could walk around the artwork and see different viewpoints. Plus, I think that design element with all the sequins, beading, cloth and textile is so cool… I think they [are artworks people] can really get involved with and that could be one thing that would draw people in. Check back next week for 30 Encounters with 30 Americans: Conversations XVI – XVIII. 30 Americans is at the Milwaukee Art Museum from June 14 through September 8, 2013. For more information, please click here.